Another glorious day in Edinburgh, and what’s more the weather was rather nice, too! As it reached lunch o’clock, I thought I’d head to Bobby’s as I’d picked it out as the next place to visit when over that side of town. MJ had given her royal assent to this venture, as she sometimes pops in their on her way past, and had told me it was quite good. Upon walking in, I found a well laid-out little place, with an array of different sandwich options on shelves, ranging from simple ham and cheese type things, to hot-smoked salmon (as sampled at Bon Papillon, yesterday), with tempting choices in between. 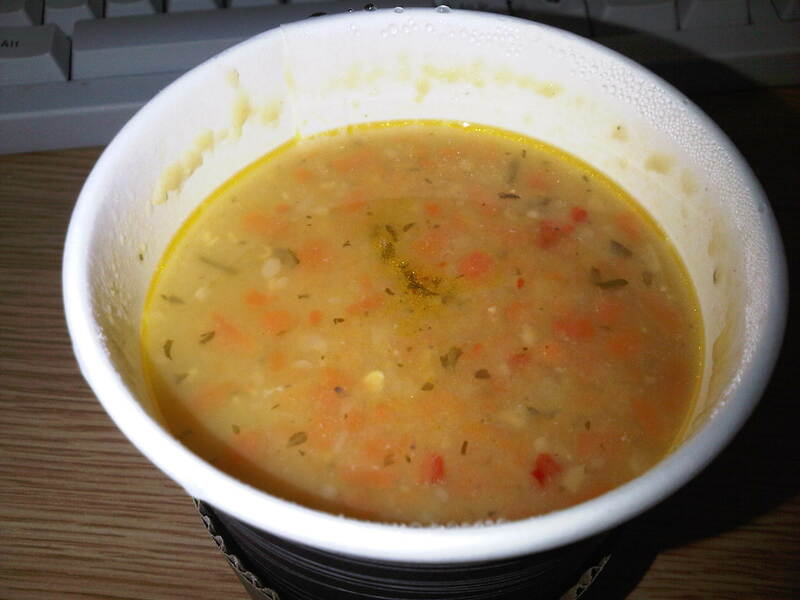 Despite the increasingly summery temperature, I have yet to be persuaded away from my lunchtime diet of soup, soup and more soup. Today, I matched lentil soup with a mozzarella, sub-blushed tomato and pesto ciabatta. Price wise, it was comparable with the top end of Broughton Street prices, but that reflects its positioning at a key tourist/student nexus. The walk back to the office was complicated by one rather curious oversight – they had no bags to aid the safe carrying of my items. Very ecologically friendly, I’m sure, but not very helpful to the furtherance of my simple aim of getting my lunch back to the office in a reasonable state. The sandwich stood up tolerably well to being shoved in my pocket, but the soup definitely cooled from being carried in my hand. This meant that the soup needed immediate attention upon my return to the ivory basement. By the standards of takeout soup, it looked really quite bonnie. Once given a good stir, it revealed itself to have a lovely thick-but-not-too-thick texture. And the taste experience was very pleasing, too. This was a good, well-crafted soup. Mind you, Bobby’s has a lot of competition on the soup front, what with Union of Genius, Elephant Juice, and Peter’s Yard, nearby (and Hula not far away, too). It’s nice to think that we have quite the burgeoning “soup district” growing up. The sandwich was high quality, too. 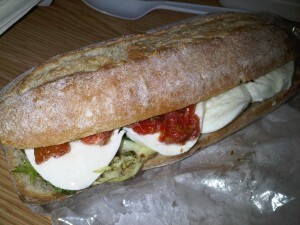 The mozzarella was good and fresh, the tomatoes sweet and packed with flavour, and the pesto rich with basil goodness. The classic flavours came together, very nicely, making each mouthful entirely joyful. So overall, Bobby’s served me very nicely. Both the soup and roll were very good, and the range of sandwiches on offer was such that your interest is likely to be well retained, should this be your local sandwich place. Now, if they could just get some bags so that folks can properly brown-bag their lunch, they’d have me stopping-by on a regular basis. At long last Bobby’s Sandwich Bar has a website (which is still under development). The day you were there was unusual as handy little brown paper carrier bags are normally available; a delivery error had occurred. I hope you will like the selections if you drop in again. 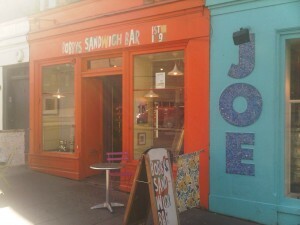 I do love a good sandwich from Bobby’s.